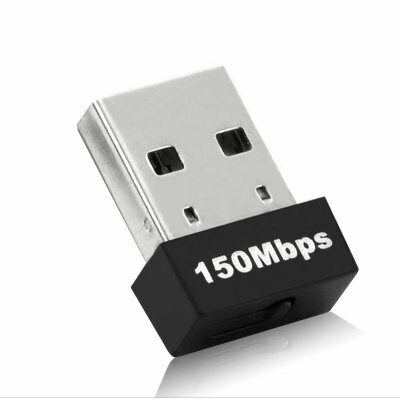 Successfully Added World's Smallest Wireless USB Adapter (802.11 B/G/N) to your Shopping Cart. World's Smallest Wireless USB Adapter (802.11 B/G/N) - high-speed wireless connectivity to your laptop or desktop computer is now available in an ultra small and portable form! This Wireless USB Adapter easily adds wireless capabilities to any laptop or desktop computer. Compatibility with 802.11b/g/n guarantees you the fastest way to access internet, as you can be sure it'll work with your wireless router or any public WiFi hotspots. The ultra small design is perfect for use with portable laptops and is ideal for users who are always on the go. The compact, mini design makes this adapter ultra portable and easy to take with you anywhere. There is no need to worry that one USB interface will be blocked by its neighbor with the adapter being so small. A device the size of a fingertip designed to keep the workspace neat and tidy. Even better, it is extremely easy to use - just plug it in! Best of all, at speeds of up to 150 Mbps, Wireless-N technology provides you the fastest way to go online. This wireless USB adapter provides the greatest flexibility for your laptops and computer and is perfect for surfing the web, downloading your favorite tunes, and sharing pictures with friends and family. This Wireless USB Adapter is on offer now for an amazing price. Why not click "Add to Cart" right away to buy one for your home, office, then stock your online store with this incredible all in one gadget. Order today and we’ll ship it out tomorrow, it will also come with our verified 12 month guarantee, and so you have nothing to worry about. Brought to you by your extreme friends here at Chinavasion! So small, you can permanently fit on the laptop or desktop without any fear of being broken away. I bought 3 of these units on October 23rd. One for a desktop computer that had no wifi and one for a Ben Q netbook with a faulty wifi adapter. The third I use in my Dell Inspiron N7110 which has a defective wifi adapter since new last year. All three units have worked flawlessly so far. They are small, and you hardly even notice them. Great product so far and i would recommend. I f these keep on performing well, I will be buying more of these! on 2011-10-30 14:27:34 Great tiny little wifi 802.11n dongle! I was looking for something with a small form factor that would fit into my Handhelds and replace my old 802.11g wifi dongle in my desktop, and I found these little dongles to be perfect! I have a few devices constantly using them now for a week or so and I haven't had a single connectivity problem and the speed has been beautiful! I didn't need to install any drivers for my linux laptop or windows vista pc at all and even my linux handheld had the proper drivers installed and sets itself up within seconds of plugging in the dongle! All in all, I'm very happy with these dongles and they're extremely light! The tether hole is small, but there if you wanted to either put it on a chain of some sort or use a string to tie it to your device too. LED is sufficiently bright, but doesn't seem obnoxious in how bright it is.